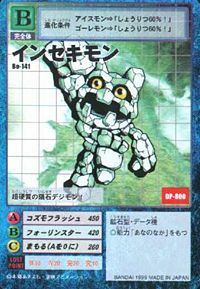 A form of Gottsumon which for some reason had the meteorite data within the ore data it possesses appear on its surface. 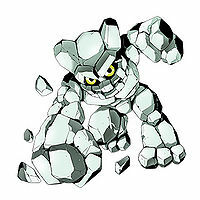 It is made from a hard material which only exists in space, and possesses powerful defensive ability. Its Special Move is emitting a mysterious, cosmic energy wave (Cosmo Flash). 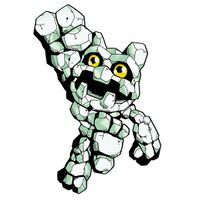 A Perfect level Digimon that evolved from Gottsumon. Its Special Move is "Cosmo Flash". It fires cosmic energy at the opponent. 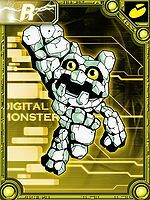 — Digimon Savers: "Once More, To the Digital World, Insekimon's Great Rampage"
Hits the opponent with an explosive punch. 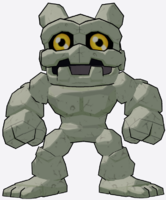 Guard Rock  ガードロック Gādo Rokku Invincibility Prevents all damage from next attack done by enemy. Drops one or more meteors on an enemy. Swings its arms wildly at an enemy. Cosmo Flash  コズモフラッシュ Kozumo Furasshu Galactic Flare/Cosmic Flash/Cosmo Flash Summons cosmic energy, causing a meteor shower or sending opponents to another dimension. In Digimon Savers - Episode 23, Gottsumon obtained the power to evolve to Perfect and fought with the DATS team. 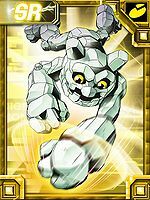 He has tremendous speed, but was tricked by Rize Greymon and blasted to pieces with Rising Destroyer. 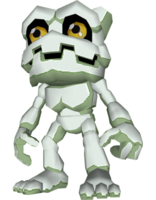 When a meteor crashes in the Speedy Time Zone of Ancient Dino Region, the player is sent by Tyranomon to investigate. 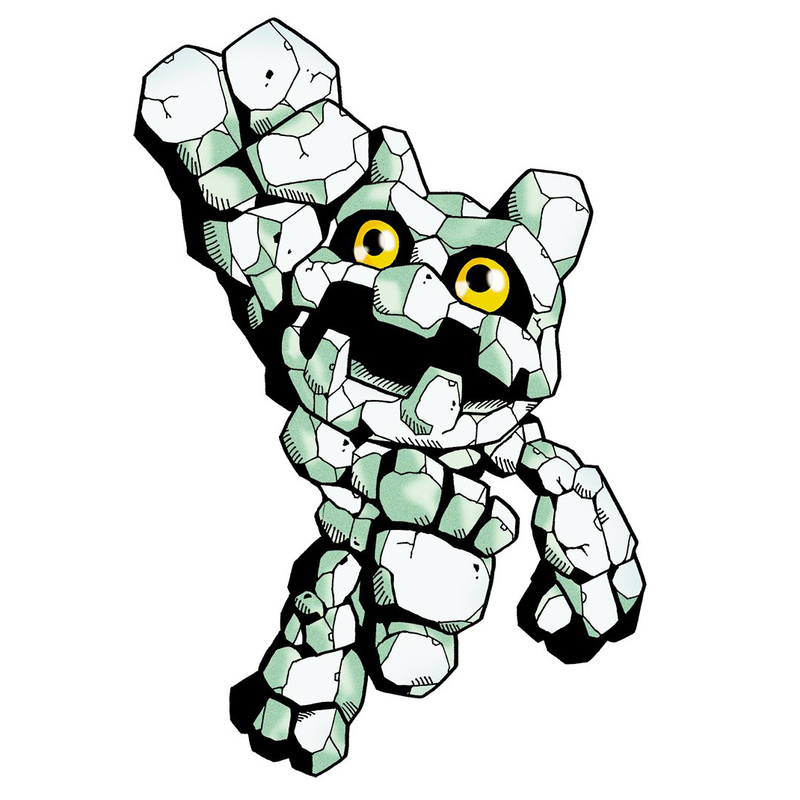 The meteor turns out to be Insekimon, who attacks the player. 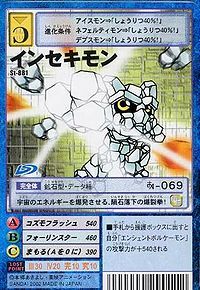 Insekimon evolves from Centalmon (0+ DP), Drimogemon (0+ DP), Icemon (0+ DP), Tsuchidarumon (0+ DP) or J Mojyamon (0+ DP). 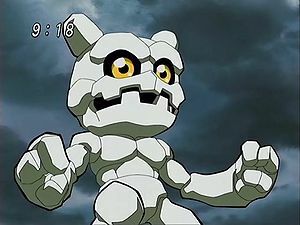 Insekimon can evolve into Metal Garurumon (0-19 DP) or Baihumon (20+ DP). Can be evolved from Hookmon if above level 28, or can be found at Chrome Factory. Insekimon can be encountered at Ueno Digital Shift. Evolves from Ankylomon, Nanimon, or Leomon at level 26 with 110 DEF. Evolves into Ebemon at level 45 with 120 SP, 120 INT, and 20 ABI; Metal Etemon at level 45 with 100 SP, 120 ATK, 140 DEF, and 20 ABI; or Dianamon at level 55 with 120 DEF, 130 INT, 130 SPD, 20 ABI, and all the DLC missions with Sayo complete. It is also available as a Digimon Medal. The falling meteor's bursting fist explodes with the energy of the cosmos! 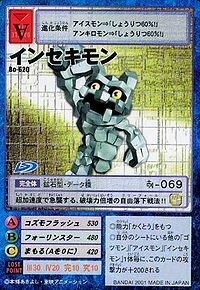 A meteorite Digimon of super hardness! Its freefalling doubles its destructive power as it does a super-accelerated assault!! ↑ Digimon Savers: "Once More, To the Digital World, Insekimon's Great Rampage"
This page was last modified on 7 January 2019, at 01:05.